Few days in Boston go by without a front-page headline involving a sports team. The Red Sox, Bruins, Patriots and Celtics draw fans from the entire New England region, and those who follow the teams are some of the most passionate and involved in the nation. "They really really care. They’re emotionally invested in it," Bruins forward Shawn Thornton said. "If you don’t play well, you hear about it. I hear about it. It’s not like that everywhere. They really care. It might not be the easiest place to play, but it makes it one of the greatest." The intensity of the Boston sports community demands that players perform at the highest level no matter the circumstances. "You have to have a lot of things covered as a ballplayer, as a person in the community to go to Boston," Red Sox outfielder Jonny Gomes said. "That’s just not really the landing spot for a couple years or the in-between good and bad years. They expect you to bring it. And I would think all organizations do, but I think you can kind of hide it in other places." Due in large part to this environment, every year seems to be a remarkable one in Boston sports, but unique situations made 2013 a year the Boston fans and players may never experience again. This is the story of this period as told by some of the people most directly involved. The year 2013 started with concern in Boston. The NHL was in the midst of a lockout, and a city still rabid for hockey following a Stanley Cup championship in 2011 was left wondering if the beloved B’s would even step on the ice that season. Thornton: There were a bunch of us that were in town. We skated at [Boston University] three to four days a week and worked out five to six days per week, making sure you’re good to go so it wasn’t like there was any time off for us. It was actually probably more work when you’re working out for that amount of time. It’s miserable. The NHL and its Players’ Association ratified a deal on Jan. 12 to end the lockout. The Bruins played their first game of the season on Jan. 19 and beat the New York Rangers, 3-1, before embarking on a whirlwind, condensed schedule to cram a season into just over three months. Ferola: We’re disappointed that we didn’t start the season on time, but when we got the call that, ‘Hey, they’re starting, let’s do it,’ we were packed. Everyone was excited. We put on our pre-game video and everyone’s all fired up. We’re reliving 2011 when they won the whole thing and, I mean, it was kind of like you didn’t really skip a beat in a sense, because everyone was so excited to go back to the Garden and be a hockey fan again. Thornton: We were fortunate that we got off to a hot start. That probably helped carry us through the condensed schedule. We were very fortunate there, but I liked it. Playing every other day, or playing three games in four nights. I’d rather be playing than practicing, personally, so I didn’t mind it. As any remnant concerns from the lockout faded, the Celtics and Red Sox joined the Bruins in the headlines. First, toward the end of January, Celtics guard Rajon Rondo went from being a late scratch during a game against the Miami Heat to missing the rest of the season and more with a torn ACL. At the end of March, it looked as if the Bruins were set to trade for Calgary star Jarome Iginla, but the deal fell apart at the last minute when Iginla chose to go to the Pittsburgh Penguins instead of Boston. At the same time, the Red Sox were licking their wounds from a last-place finish in the 2012 season as they returned to Fort Myers, Fla., for spring training under new manager John Farrell. Craig Breslow, relief pitcher for the Red Sox and founder of The Strike 3 Foundation: The atmosphere in spring training was one of excitement and enthusiasm. 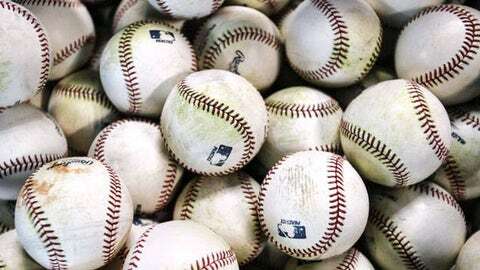 The combination some of the veteran guys brought in to help change the climate of the Boston Red Sox, and the core of returning players were anxious to pen their own version of the 2013 team. From the outset, the only focus of the team was on winning, on preparing every night to win the game on that given night. John [Farrell] did an outstanding job of communicating the roles of each player and of demanding accountability. Gomes (as told to Gabe Kapler): I didn’t get my other foot in the door before I realized that core group of guys, [Dustin Pedroia], you kind of see right out of the gate, they got sweat on their brow and they’re just … I don’t know if it’s a chip on their shoulder — I guess that’s individual — but they were on a mission from Day 1 to erase that season. This isn’t going to be like a feel sorry for us, head in the sand. These guys definitely had one thing on their mind and it wasn’t erasing 2012, it was winning the World Series. Because 2012, I think inside that clubhouse, was basically just hit delete from the last out that was made. The Red Sox got out to a 5-3 start, but fans weren’t quite ready to jump back on the bandwagon after the frustrations of the 2011 and 2012 seasons. On April 10, the Red Sox’ 10-year sellout streak at Fenway Park ended. Gomes: When that happened, we were just joking around like ‘Well, I guarantee it’s going to be a sellout for the playoffs.’ That’s when it matters. Five days later, any thoughts about the sellout streak fell to the wayside. On April 15, 2013, the Red Sox played their traditional 11 a.m. Marathon Monday game and thrilled fans with a walk-off win in the ninth. Less than an hour later, with fans having joined the crowd at the marathon finish line on Boylston St., the joy of Patriots’ Day came to an abrupt and terrifying end. Former Patriots offensive lineman Joe Andruzzi was standing with his wife just past the finish line when the bombs went off. His charity, the Joe Andruzzi Foundation, had a marathon watch party at Forum, the site of the second bombing, to raise money for cancer patients and support the foundation’s 21 marathon runners. Andruzzi: We felt the vibration. We were right there, saw the cloud of smoke and looked at each other and we said, ‘What was that?’ Then 10, 12 seconds later, the second one went off. It was just nobody knowing and it just felt like once you heard the second one, then it was the shock. Everybody got going. There was a mother/daughter tandem team that I’ve gotten to know throughout the years in the community here and they were running the marathon together. I looked over and her fiancé was running with them. I looked at him and he was bleeding down the side of his face. I grabbed him, I grabbed the daughter. She was in the stroller. I grabbed the mother, they were all in shock, ran them over to the medical tent. I turned around and just started moving fences around. There was a guy there, the [fences] were all zip-tied so one guy had a knife in his pocket. He was cutting the zip ties and knocking over the fences, just trying to get channels to [the victims], then I just tried to make my way down Boylston. I made it to about the first bomb site and it was pretty … it was chaotic. We went down the back alley and tried to make it back to Forum, where all our people were. As we made it down across the back alley, my wife pointed out the three young girls trying to carry a woman on their back and they were struggling doing it. I ran over there and that’s the picture you probably have seen. I picked her up and walked her down the block to an ambulance and waited there, calmed them down. Phones were down, they weren’t working, so I just managed to make my way back down the back alley to Forum. I got down there and I saw some of the workers coming out, not knowing what I was about to hear. 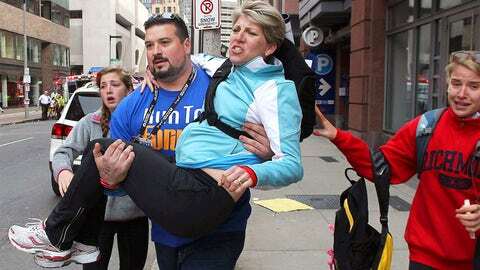 This photo of former Patriots player Joe Andruzzi carrying a woman from the scene became an iconic image of the marathon bombing. The whole place there was probably 90 percent JAF (Joe Andruzzi Foundation) people and my heart dropped. There was a little 4-year-old boy that was battling cancer that was blown off the couch. It was pretty … pretty gut-wrenching and to come to find out that one of the workers came out and told me that the second bomb went off right in front of Forum. Breslow: I was still in Florida recovering from a shoulder injury, but learned of the bombings through a friend who had participated in the Marathon. I was asking how the run had gone when he responded that ‘something just happened, sounded like a bomb, something very bad.’ As the details unfolded, I was filled with the ambivalence of wanting to be closer to teammates, friends, family and the people of Boston, but knowing that there was nothing that could be done. Thornton: I always nap around 2 p.m. to about 3 p.m [on game days]. I went downstairs and turned on my coffee machine and turned on my TV and saw it. I didn’t know what to think. It was a surreal feeling. It doesn’t feel like it’s real. I didn’t know the extent of it, so I went to the rink at 4:00 when I usually get there, three hours before the game. [Bruins GM] Peter [Chiarelli] came in and said, ‘The game’s canceled. Go home and be with your families.’ Then I was just like everyone else: sitting on the edge of my couch, staring at my TV, waiting for things to develop. I’ve been here for seven years and I live here year-round. Everyone knows somebody that was down there or someone that was running. It touches you personally. Andruzzi: We headed home to give our five kids a great big kiss and hug. You get a tear in your eye. It was a pretty tough feeling, just very glad [to see my family] and then not so glad when you hear of the people that were injured and the people that it took their lives. All I can think about is my brothers, my three brothers that are New York City firemen, and one was in Tower 1 during 9/11. I remember when my phone wasn’t working, and the last time my phone wasn’t working was 9/11. It was an eerie feeling. When the bombs went off, the Red Sox were already on their way to the airport for a three-game series against the Cleveland Indians. Gomes: There was a huge stage of panic because obviously there were so many unanswered questions. Is there a bomb on our bus? Is there a bomb on our plane? There were guys like, ‘I don’t want to get on that plane. Is our plane safe? Have they checked our plane out? Are our houses safe? Are they going after all athletes? Like the runners and then going after the Sox.’ Then there’s obviously rumors flying like wildfire. There’s a bomb at Fenway; there’s a bomb at the hospital; there’s a bomb at the library — total lockdown. Here we are leaving Fenway Park, our city and our families, so it got hairy. On Tuesday, the area around the finish line remained shut down as part of a 15-block crime scene, but other parts of the city attempted to return to as close to normal as possible. Still, the sounds of sirens and the chopping of helicopter blades continued to pulsate in the air. Despite not being in the city, the Red Sox showed their thoughts were with Boston via an Instagram photo taken from the visitor’s clubhouse at Progressive Field in Cleveland. Whoever came up with that absolutely nailed it because that’s the approach that we have to take. It’s not like be bitter at anyone. It’s not like a slogan you’d look at and just instantly be sad. So I think I’ve said over the course of time, over the course of the season, it no longer was like a slogan. It pretty much became a lifestyle for us and the city of Boston. The Bruins were the first team to play in Boston after the bombings when they faced off against the Buffalo Sabres at the TD Garden on Wednesday. Although Bostonians still did not know who was responsible for the attacks or where the perpetrators were, they came together as one during the singing of the national anthem that night. Thornton: It made the hairs on the back of your neck stand up. It’s just another example of how this city comes together and how much love they have for each other. Andruzzi: The feeling of everybody being united and especially at the Bruins game, everyone taking over the song. My buddy that was there said he got chills. He said they showed that picture of me carrying the woman and the crowd went nuts. Gomes: I thought that was one of the coolest things I’ve ever seen in sports. It was Boston united as one, and, along with ‘Boston Strong,’ I thought that was another really huge tradition that Boston created to where we’re all going to sing the national anthem because we’re all on one page. It’s like Boston as one, and no one is more important than the next. The city shut down once more on Friday when Boston and many suburbs went under lockdown as local police and federal officials scoured Boston, Cambridge and ultimately Watertown for the man people believed to be responsible for the marathon bombings. For the second time in a week, the Bruins game scheduled for later that night was canceled. Gomes: So we get back from Cleveland real late. It was a night game. We land and get to the ballpark around 1:30 in the morning and it was: Go to Fenway, grab your cars, get a quick sleep and we were just pretty much going to be like boots on the ground throughout the whole city. Just 25 guys splitting up. We had places we were going to go visit. There’s four hospitals in the area. Right when we land, again, all the news (said) that there was a shooting at the [Massachusetts Institute of Technology] campus. So that really didn’t trigger too much, I guess, just a standard, ‘What the hell is going on?’ type of deal. And then we find out it’s these guys and they found the bombers, and then one guy is on the loose. The news got more and more heavy to where the whole city is on a lockdown. Thornton: I remember I just sat on my couch. We didn’t go anywhere. Nobody went anywhere. We just sat there and watched the TV all day. It’s weird because you don’t know how long it’s going to take. You’re sitting there just waiting and waiting and waiting. You don’t want to turn off the TV, you don’t want to do anything else just in case you miss it. I’m pretty sure I was just like any other person in Boston or even in the country at this point waiting to see where this guy was. Ferola: Friday afternoon we were supposed to open and then they decided not to have the [Bruins’] game again. So we were going to close and then when we got word that they had apprehended the second bombing suspect in Watertown, we decided to open up for the night for the people in the area that were kind of stuck in their houses all week and wanted to get out and kind of breathe some fresh air again. We opened up around 9:00 that Friday night, back open for business. We raised roughly [$12,000] for the One Fund. We had started talking about it Friday afternoon when we figured out once this was all over we were going to open up and then that whole weekend we just had donation boxes out. We were offering to people, ‘I’ll buy you a round of drinks, why don’t you throw some money in?’ Especially after the Bruins game, after they caught the second suspect, we were able to do a really great job raising some money for the One Fund. Along with the beginning of fundraising efforts came questions as to why anyone would commit such a heinous act. Andruzzi: Maybe a psychologist will get some answers and some thought process because I’m sure a lot of us don’t understand. It’s America. You’re here. You’re living here. Land of the free. You’re here for a reason. Why take that away from people? Especially take it away from youngsters, the family that was truly affected with losing a son and the daughter being injured, so it’s tough when you think like that. You get choked up. You don’t know the answers and you don’t know what goes through their head. On Saturday, the Red Sox played their first game at Fenway since the bombings. At the same time, designated hitter David Ortiz was set to play in his first game of the season after starting the year on the disabled list. Ortiz’s biggest impact that day, though, came before the first pitch when he gave an emotional speech during a pregame tribute for the marathon victims. Gomes: What are the odds? David Ortiz not starting the season because he started on the DL, so his first game back is the first game back that we’re able to play after the bombings. You can’t plan that by any means. That’s David right there. He’s so much bigger than a ballplayer. His heart is so much bigger than just an athlete for the Sox. When he grabbed that mic, he basically with the words he said and the message he said, that we’re not going to get our heads in the sand by any means. We’re going to take this adversity and use it as motivation. Any time that big guy opens his mouth, not only do you listen but you accept the message and the challenge and I think we did and I think the city did as well. Andruzzi: Even if you’re not a Red Sox fan, when Big Papi got up there … they’re right there. They have a Marathon Monday game and they were right there and a lot of their fans were making their way to the marathon after they watched the game. It affects them a great deal and he understands. He’s been here for a while and he knows what the city is about. Thornton: Papi is the man, huh. I love that guy. I’ve gotten to know him over the last seven years and that’s him. He has a really big heart. Sometimes people have trouble looking in a positive way past the Big Papi persona because he is almost a giant character here. But he is a really, really good person and I think when you see him do things like that, people get a taste of it. Ferola: To have David Ortiz speak as passionately as he did about the city of Boston, to have the Celtics do a tribute, to have Rene Rancourt let the Garden sing the anthem with him, those are the things that make you think, ‘Well, Boston is so tight-knit and everybody is on the same level.’ Especially at times when you’re dealing with tragedy. No one is better than anybody else. Everybody is on the same playing field. I think the athletes that we have in the city are heroes to us, but at the same time they bring that sense of community and that sense of closeness to us, that especially in a time like this. It just makes you feel happy to be a part of it and love this city as much as you do. As the city began to heal, the memories from the marathon stayed with the various teams. The Boston Strong motto remained in force as the Bruins competed in the NHL playoffs. The city especially rallied around the Bruins in their incredible come-from-behind win over the Toronto Maple Leafs in Game 7 of their first-round series. The B’s were down 4-1 with just over 10 minutes to play in the third period. A goal at the 10-minute mark followed by two more tallies within 31 seconds in the final 1:22 of regulation sent the game into overtime. Patrice Bergeron netted the series-clincher 6:05 into overtime to lead the Bruins past the Leafs, 5-4. Thornton: I didn’t play in the third or overtime, so I had the best seat in the house for it. It was remarkable. It was one of the best games I’ve ever seen. We were very fortunate to pull that out because this locker room would look a lot different if we didn’t win. It was one of the best games I’ve not just been a part of, but one of the best games I’ve ever seen in sports. Gomes: Signing up for the Sox or really any of the four major teams up there in that Boston area, you follow real close to all the Boston sports. We were locked in 100 percent. If you weren’t a hockey fan, you turned into one real quick. I think one of the biggest things obviously was watching them fight and watching them grind throughout the whole playoffs. Andruzzi: To have those times in sports, sports does a great thing for our country. What they were doing, they were playing those games and getting their fans and everybody in Boston to have their back and cheer them on and get their minds off of what just happened but also pushing toward a Stanley Cup. It wasn’t just a regular-season game. They were going for a championship and that made it more of a moment. Ferola: Coming back and winning in overtime, that was our Stanley Cup. That was [them] pulling together and winning a game for the city, and it breathed new life into the city. The Bruins did not win the Stanley Cup, but they carried the city as they advanced to Game 6 of the Stanley Cup Finals before falling to the Chicago Blackhawks. Thornton: We’re just a small part of [the city healing]. We’re just playing a game. If people want to jump on it and embrace it, that’s great, but we didn’t say, ‘We’re the men. Let’s take care of [it].’ … The real people are the people that helped out and the people that fought through it and the people that helped find that guy, all the first responders and all those people are the ones who deserve the credit. We’re just playing a game, trying to get people’s minds off it. It was a hell of a playoff run. We came up a little short unfortunately, but we made a good stab at it. I don’t think there’s one guy in this room that was happy with losing that. We really wanted it and unfortunately we didn’t win it. That will haunt me for sure for the rest of my days, even after I retire, I’ll still be thinking about the one that got away. We were so close. Gomes: It was really tough to watch them lose because on our end as fans of the Bruins and of hockey and the area, what a total crazy, magical season and ending it would have been for them to win. I didn’t talk to everyone individually, but I do think us as players and for the Sox we did put a little bit more pressure on ourselves to where we need to win this whole thing. We couldn’t end the sports season in the calendar year of 2013 with two losses there. I think truly everyone dug down a smidge more to make this a magical season. The Bruins’ loss in the Stanley Cup Finals on June 24 should have meant Boston sports news would quiet down before the summer months, but fans found it was just the opposite as the city became the center of the sporting world once again toward the end of the month. One day after the Bruins season ended, Celtics coach Doc Rivers ended his career in Boston by signing with the Los Angeles Clippers. Two days later, Patriots tight end Aaron Hernandez was arrested and charged with murder. Two days after Hernandez’s arrest, Celtics players Paul Pierce and Kevin Garnett were traded to the Brooklyn Nets. Then, six days later, Bruins star and former No. 2 overall draft pick Tyler Seguin was traded to the Dallas Stars. Thornton: I’m very fortunate. I went to Ireland for five or six days and all that happened while I was gone. I was away for it, and I had a bunch of text messages on my phone over there from people here asking, but I was on vacation with the wife. I was away from it. It was my time to decompress. It was a very busy week in the world of sports. Obviously, the Hernandez thing is a tragedy. Doc leaving, he was a big part of the city for a long time. Seguin trade, whether people saw it coming or not, I don’t know. I think the organization made the best decision for the organization to win now. I guess ignorance was bliss for me. While those 10 days were full of major sports stories in Boston, the most shocking story surrounded the Hernandez arrest. The saga began on June 17, when 27-year-old Odin Lloyd was found dead in an industrial park about a mile from Hernandez’s home in North Attleborough, Mass. On June 18, police searched Hernandez’s home for the first time in connection with the ongoing investigation into Lloyd’s death. While Hernandez was not officially named a suspect at the time, his name was not cleared either. On June 20, with helicopters and news trucks following his every move, Hernandez went to Gillette Stadium for unknown reasons, possibly to work out. According to reports, coaches were on vacation at the time and the team’s executives were not there, although some Patriots staffers were on hand and told Hernandez to leave the premises. 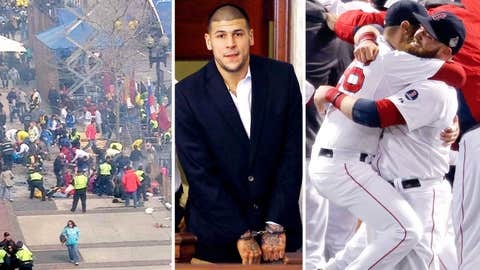 After the media trailed Hernandez to a local gas station, the tight end drove into Boston toward his lawyer’s office. When Hernandez was drafted in 2010, it wasn’t clear whether picking him was the right move. He fell to the fourth round due to character concerns despite his considerable talent. The Patriots took a chance on Hernandez and it seemed to pay off, as the 23-year-old stayed out of trouble and signed a five-year contract extension in August 2012. In November of 2012, he became a father and called the birth of his newborn daughter a “life-changer" while saying his young and reckless days were behind him. Therefore, the charges against Hernandez in June came as a surprise to Andruzzi and many in the New England area. Andruzzi: You can’t hold everybody’s hand that comes through that door. It was a shock to everybody. Nobody knew. Nobody I’m sure can still believe that he was capable and he … whether he did it or not we’ll find out in the future, and he chose a different path when he left the stadium. Whatever was going on was his own world. Following the arrest, the Patriots organization allowed fans to exchange Hernandez jerseys free of charge at the team pro shop. Owner Robert Kraft told the media that should the accusations against the tight end prove to be true, he would feel duped by Hernandez. The members of the team did not speak on the matter until the end of July when, during media availability in the first week of training camp, they expressed their disappointment in their teammate and their sadness over the entire situation. Bill Belichick, Patriots head coach: It’s a sad day, really a sad day, on so many levels. Our thoughts and prayers are with the family of the victim. I send my sympathy really to everyone who has been impacted. A young man lost his life. His family has suffered a tragic loss, and there’s no way to understate that. When I was out of the country, I learned about the ongoing criminal investigation that involved one of our players, and I and other members of the organization were shocked and disappointed at what we had learned. Having someone in your organization that’s involved in a murder investigation is a terrible thing. Vince Wilfork, Patriots defensive tackle: It was disappointing. It was sad. There’s really nothing much that you really can say. Just sad and disappointing was the biggest thing. Tom Brady, Patriots quarterback: I think everyone had a certain range of emotions, whatever they might have been, but those were really personal. I dealt with them. At some point you have to move forward, and I think we as a team are doing that. Thornton: You really got the sense that that team was a real close-knit group. You get the feeling when you’re around them that they had something special within the room. Obviously the walkoffs and the way they went from worst to first is really special. I checked out a lot of games at Fenway and they were fun to watch. With each win that brought the team closer to October baseball, beards began to sprout up not just in the Red Sox clubhouse, but on the faces of the people sitting in the stands at Fenway. The Red Sox even hosted a “Beard Night” in which all fans wearing some version of facial hair could get into the park for $1. Thornton: We grow them for [a few] months if we go all the way in the playoffs and they drive me nuts. I think Nap [Mike Napoli] still has his. Him and Gomes, Jonny Gomes. I met him at one of the games in the locker room and it was pretty early in the season. His beard looked pretty good already, and I asked him and he was like ‘Why not?’ That’s a pretty cool attitude to have. They all bought in. That’s another example of how tight they were, how close of a group they were. Three months is one thing. They grew those things for seven, eight months. That’s pretty impressive. Andruzzi: I wear a beard so I loved them. It was pretty cool. That was the whole team aspect was the guys that did it, the guys that were able to do it too, kept at it and were able to keep it going whether it was [one player] started having fun and [another player] may be superstitious, it was a thing for those group of guys and what they represented for the Red Sox and as a team. With beards in tow, the Sox continued their trek from worst to first by winning the American League East and qualifying for the postseason. Breslow: It was incredible. Every player who has ever put on a big-league uniform dreams about winning the World Series. The first step in that ultimate goal begins with making it to the postseason. There was so much excitement throughout the city. It had a different feel than I had ever experienced before. Ferola: Last year they were in last place and we had nobody in [The Greatest Bar]. The years before when they were in the playoffs and I was working here, we would get people stopping in on the way to the train, on their way home checking out the Sox game to see what’s going on. When they did as poorly as they did last year, everyone just kind of gave up on them and they could care less to watch the games. It was kind of the same thing at the start of the season. So you’re thinking to yourself, ‘Is this going to end like last year, are we not going to have anyone coming in?’ Then for them to make the playoffs this year and have the best record in the East, it’s the complete opposite. Now we’re thinking we’ve got to be ready for Red Sox fans. The Red Sox topped the Tampa Bay Rays in the first round of the playoffs with relative ease, but the start of the ALCS was more of a challenge for Boston. After struggling to get a hit against Detroit pitching for much of the first two games, David Ortiz changed the complexion of the series with one swing of the bat in the eighth inning of Game 2. His grand slam, celebrated famously by the Red Sox bullpen cop, Officer Steve Horgan, tied the game 5-5 before the Sox walked off to a 6-5 victory thanks to a Jarrod Saltalamacchia single in the ninth. Breslow: Ortiz’s home run was the critical event in the 2013 postseason. I believe that things play out drastically different if David doesn’t hit the home run, and we don’t eventually win that game. After a few controversial endings at the start of the Sox’s World Series with the St. Louis Cardinals, the team had the opportunity to win it all at Fenway Park for the first time since World War I.
Breslow: Winning the World Series is an incredible feeling. To win in front of the hometown crowd in your home venue is even more incredible. However, to win the Series in Boston and give the fans of the city a final reason to smile, given a six-month struggle to move past a horrific incident, was a fitting end to an incredible run. Thornton: It’s a special thing when you get to win at home in front of your home fans. It amplifies the experience I think, and, again, we didn’t get to watch a lot of them because we had games every night. It actually kind of pissed me off. But when we did, it was just a fun story to watch. It was awesome that they pulled it out. When President Barack Obama visited Boston in the aftermath of the marathon bombings in April, he told the world, “We come together to celebrate life and to walk our cities and to cheer for our teams when the Sox, then Celtics, then Patriots or Bruins are champions again, to the chagrin of New York and Chicago fans, the crowds will gather and watch a parade go down Boylston Street." On Nov. 2, the crowds gathered on Boylston Street to watch the Red Sox World Series parade. The team did more than just drive down Boylston on bearded duck boats, though, as Gomes and Saltalamacchia placed the trophy, covered by a 617 jersey that had hung in the team’s dugout since the bombings, onto the Boston Marathon finish line. Then, Ortiz jogged the last leg of the race. Ferola: I mean there was almost silence. Everyone just kind of looked and really appreciated what was going on and everyone got that sense of this is what we wanted to see happen. Everyone was pretty excited that they got to see it, everyone would have loved to have been standing there and see it in person, but to have it on the TV and have everyone stop what they were doing for a second and really appreciate what Jonny Gomes and Saltalamacchia was doing and take that moment was really awesome. Andruzzi: I thought that was a pretty cool idea that they went out there and put the trophy and the 617 jersey at the finish line to represent what they did for Boston. What that trophy represents is a lot more than just the 2013 Boston Red Sox; it’s the city of Boston, this town, this whole New England area. Everything that revolves around it, the struggle and battles that people are still going through, they did a lot more than they realize at times. Although the Red Sox winning a World Series trophy appeared to put a cap on a tumultuous year, in reality, it only represented the end of one chapter of the story of Boston sports. Before the year’s end, a key player from that World Series team – Jacoby Ellsbury — wound up in Pinstripes. The Patriots would come back from a 24-0 first-half deficit against the Denver Broncos to win in overtime during the coldest regular season game in Gillette Stadium history. The Celtics somehow led the Atlantic Division under new head coach Brad Stevens despite being under .500. While the Boston Marathon drastically impacted the year in Boston sports, and will continue to do so for years to come, the final months of 2013 showed a return to normalcy. For Boston, however, dramatic comebacks and front-page storylines will always hold a central spot in the heart of the city. Meredith Perri is a senior studying sports journalism at Boston University. She covers the BU men’s hockey team for The Daily Free Press, and her work also appears on SB Nation, MetsBlog.com and The Commodore’s Blog. You can follow her on Twitter at @MeredithPerri. Arielle Aronson is a Boston-based freelance sports reporter, editor and web producer. Her work has appeared on Boston.com, NYTimes.com, WEEI.com and many other local publications. Follow her on Twitter at @aharonson28. The Joe Andruzzi Foundation will return to Forum for the 2014 Boston Marathon and is stronger than ever with more participants, including Andruzzi’s wife, Jen, running the marathon for the foundation. For more details on the event and the foundation, check the organization’s website at JoeAndruzziFoundation.org or follow JAF’s Twitter (@joeandruzzifndn) and Facebook (https://www.facebook.com/joeandruzzifoundation). To help with fundraising efforts, visit http://www.crowdrise.com/JAF2014BostonMarathon. The Strike 3 Foundation, which Breslow started in 2008, aims to bring awareness and support for children battling cancer. Breslow started the foundation in part to honor his sister, a cancer survivor. For more information on the Strike 3 Foundation, visit the organization’s website at strike3foundation.org or follow it on Twitter (@Strike3Fnd) and Facebook (https://www.facebook.com/Strike3Foundation).